Individuals under 20 are naturally more flexible, have higher metabolic rates and more energy than those older. But they, too, need to exercise (in appropriate ways) to avoid injury and build strength and endurance, avoid obesity and stay fit. Particularly today, when there are so many electronic alternatives, young people may exercise less than they should. It's during the formative years that individuals lay the groundwork for what later become healthy or poor habits. Kids will usually become quickly bored with routines designed for adults. But the activity doesn't have to involve organized group sports, either. A gentle jog with an adult, a tennis game, swimming, golf, martial arts, bicycling, dancing, gymnastics and many other sports are enjoyable for the younger crowd. Kids are usually sensitive to anything that appears inconsistent or hypocritical from adults. Be prepared to follow your own advice and exercise with them. That also helps parents share quality time with their kids outside the house and during activities that benefit both. Parents get the added benefit of monitoring to ensure that the kids are exercising in a safe and proper way. Like any routine, if it produces pain - even the day after - the individual is less likely to continue. Keep it simple and build up the difficulty and length gradually. Kids are more flexible, but they too need to warm-up and gently stretch before engaging in vigorous exercise. A few minutes of static and dynamic stretching will help avoid injury. Exercise routines should take into account the age group of the individual child. Children from about 4-7 should focus primarily on developing basic physical skills, such as coordination and balance. These are the years when motor skills, eye-hand coordination and other things adults take for granted are still fluid. 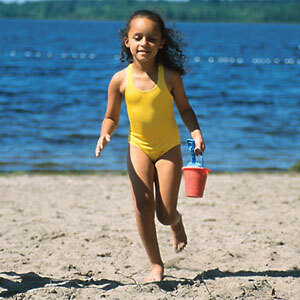 Children take to these activities naturally, as well. Jumping rope, hopscotch and other simple activities help guide the development of these skills. From the age of 8 or so, exercises can become more vigorous in order to keep that active metabolism from turning food into fat. Here again, though, adults need to guide kids in order to build good habits and avoid injury. Weight machines are almost always a bad idea for pre-teens, for example. They're risky and unnecessary. Gymnastics, by contrast, helps build on those basic motor skills learned earlier while developing strength, balance and keeping the endocrine system active and healthy. For teens, the field is wide open. They have the basic bone and muscle structure that gives them the potential for high performance activity in a wide variety of activities. But here, too, the possibility of injury remains for those who don't get the proper guidance. Teens are inclined to roughhousing and rebelliousness. Give them an outlet that directs all that energy and independence to the achievement of positive goals - fitness, endurance, high scores.